Tim-bor Professional Insecticide and Fungicide Tim-bor is a fast and efficient way to treat a structure for drywood termites, wood boring beetles, carpenter ants and decay fungi. It can be used as a wood preservative, fungicide and insecticide on its own or in conjunction with other treatments as a supplement. Because of its application flexibility as a dust or liquid, it can be applied as a dust, spray, foam or mist onto wood and cellulose building materials or inside wall voids, cracks and crevices. The active ingredient in Tim-bor Professional Insecticide and Fungicide Dust is a natural borate mineral salt with a low mammalian toxicity and has no known resistance. This active ingredient is known as Disodium Octaborate Tetrahydrate (DOT), a natural borate mineral salt and micronutrient. It is manufactured for use in the form of a water-soluble borate powder. Once it's applied in a liquid form by foaming, misting or spraying onto wood or other cellulosic materials, the borate active ingredient creates a protective envelope and remains for years of protection. Often Tim-bor Professional is dusted into places like wall voids where pests like to hide as an additional protection. When the dust gets on the insects, they clean themselves and consume the DOT during the cleaning process. Apply directly to unstained, unpainted wood or dry dust or foam into wall voids, attics and other concealed areas. Applications may be made to wood structures including decks, fences, steps, sheds, barns and other outbuildings. Such structures must be protected from excess rain. On wood with drier than normal moisture content, apply by brush or spray two applications of a 10% solution to wood surfaces. On wood with normal moisture content, apply by brush or spray one application of a 15% solution to wood surfaces. Application may also be made by drilling and then injecting the solution under pressure into sound wood or into the insect galleries of infested wood. 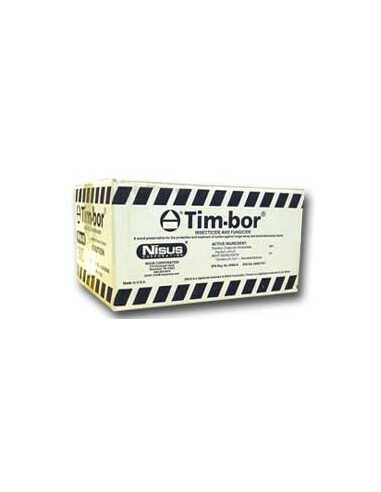 Tim-bor Professional may be applied as a foam to wood surfaces or injected into wall voids or insect galleries. General use - mix 1.5 lb bag in 1 gallon of water. This mix will treat 200 square feet of wood to a depth of 1/4"
To apply as a dry dust, fill duster with dry Tim-bor powder and dust into cracks, crevices, walls, voids, attics, etc. Subterranean and drywood termites, dampwood termites, decay fungi including white rot and brown rot, wood boring beetles such as powder post beetles, deathwatch and furniture beetles, longhorn borers, bark and timber beetles carpenter ants and other wood inhabiting ants.